At 7.30am on Saturday 14th June the annual Bucket and Spade Ride, organised by Shoreline Church, set up once again to raise money for local, national and international charities that are close to the hearts of Shoreliners and those in our community. 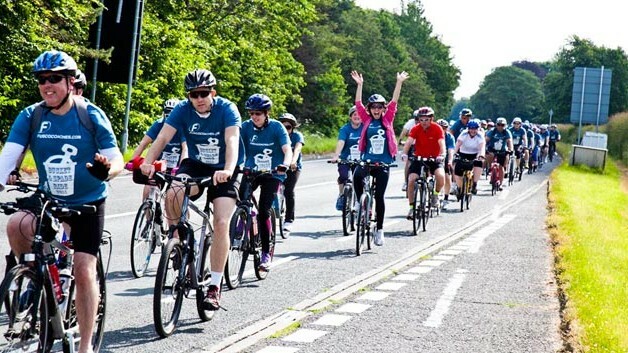 The ride, now in it’s fifth year, has grown into a much larger scale event, with over 110 riders cycling from Southport to Blackpool and back – raising over £30,000 for charity. The weather was fantastic, sun shining down all day, which meant the 75 miles was a little easier than last year when rain fell towards the end of the ride. At the finish line the Mayor of Sefton congratulated all those who took part and distributed medals. All the riders did brilliantly to get there and back in one piece, but a special mention should go to Pastor Pete Cunningham, who at the age of 72, and only recently recovering from heart surgery, took part dressed in a suit and tie – and completed over 15 miles of the ride – a brilliant achievement. Pastor Pete has taken part in the ride in previous years, and was also an Olympic torch-bearer during the London Olympics in 2012, so is no stranger to sporting endeavours – especially when it raises money and draws attention to his passion – housing the homeless of this land. You can watch a video of the bike ride below, and underneath that is a special video focusing on Pastor Pete’s journey on that hot, sunny day. Bucket and Spade Bike Ride.